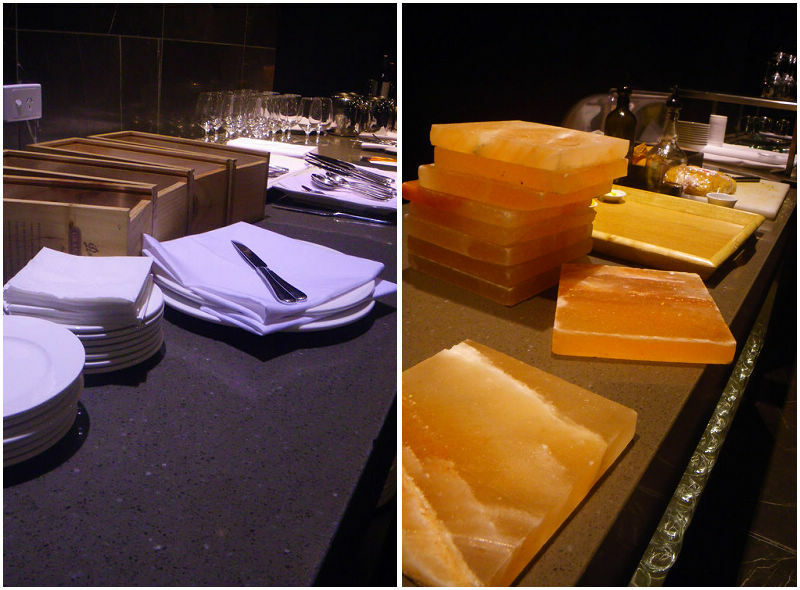 Redsalt restaurant at Crowne Plaza Adelaide has launched its winter menu. 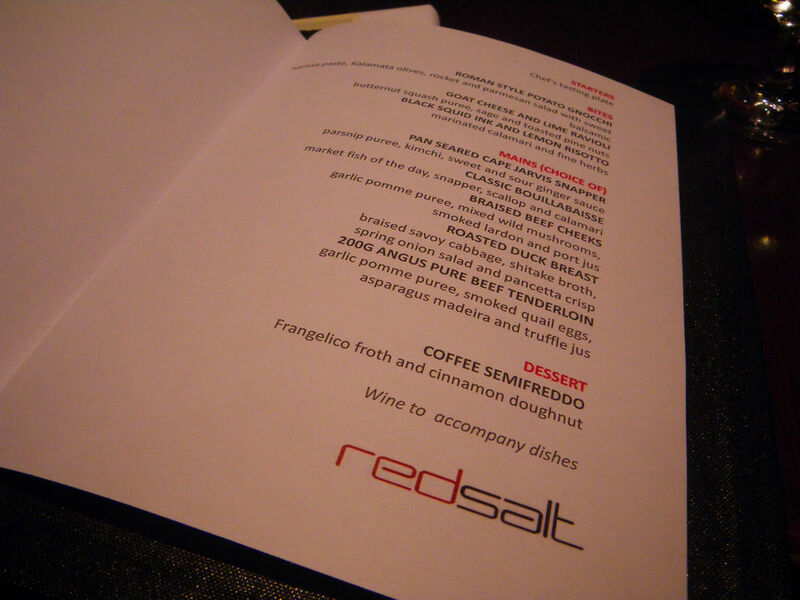 As the signature restaurant of the hotel, Redsalt has received a lot of attentions since its establishment. 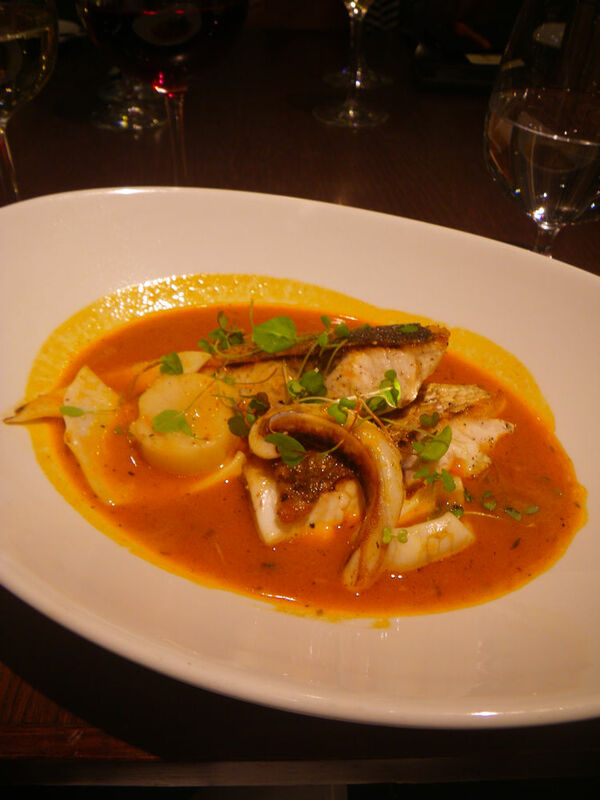 I dined at the venue when it was first opened a couple of years ago and liked the experience. Last Wednesday night saw me and Tina heading towards the restaurant after work to attend a dinner to sample the restaurant’s new winter menu. At the dinner were some other top Adelaide food bloggers as well as the new My Kitchen Rule winner, Bree. The restaurant is located on the ground floor of the hotel at the north east end of Himarsh Square. With all the floor-to-ceiling windows, diners are able to enjoy the city square greenery. As being a part of the internationally acclaimed hotel chain, every redsalt restaurant focuses on local produce as well as multi-national cuisine inspired dishes. The Adelaide redsalt restaurant is now a member of Eat Local SA, which indeed shows their embrace of local ingredients. The four-course dinner was a sneak peek of the newly launched winter menu with freshest and some of the best local ingredients. This season’s menu also had some Asian inspired dishes. 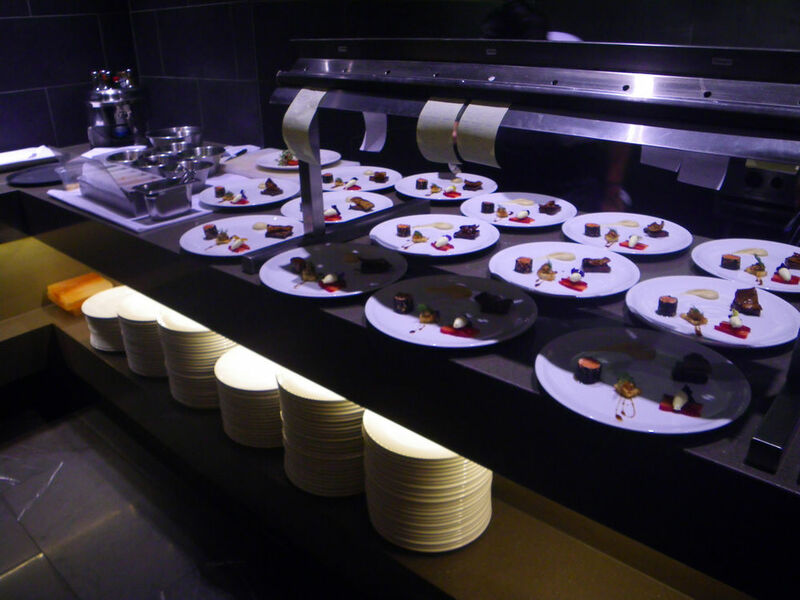 The price tags for dishes are very reasonable and affordable while the service was top notch. The menu was extensive and could accommodate different diners’ dietary requirements, whether it’s seafood, meat or vegan. The dinner started with some complementary bread. 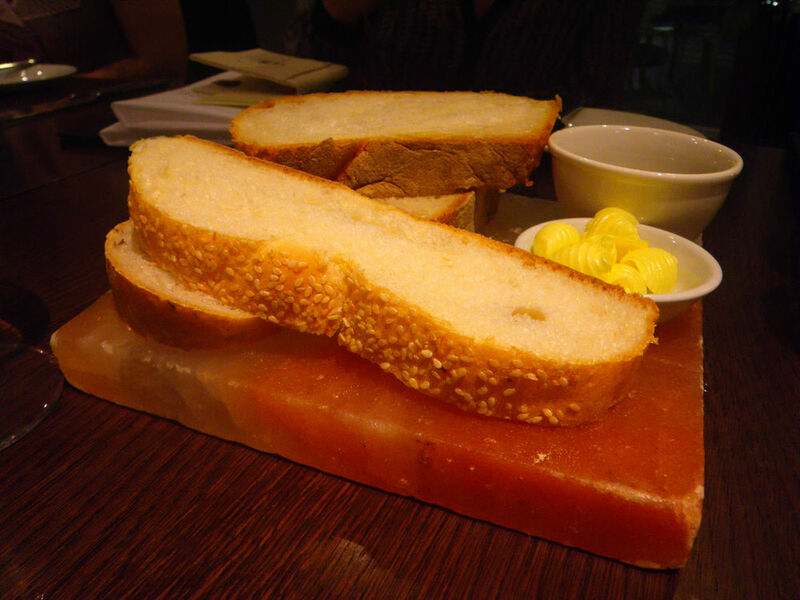 I especially liked the idea to serve them on Himalaya salt rock which made the presentation of the bread standing out from other places. The bread was served with balsamic vinegar/olive oil and butter and these two were both nice to go with the bread to activate my tastebuds. 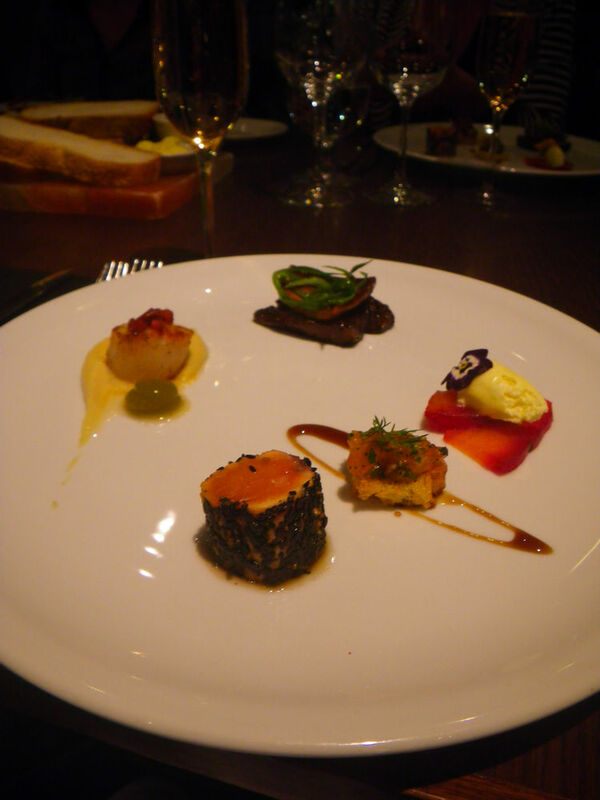 The entree for the night was the chef’s tasting plate, which consisted of three of the entree dishes on the winter menu. -> The classic tartar with organic sourdough (second front) – only wish there were more of this little creature. The salmon was cut into small pieces and went down the throat in a flash. The sourdough was crispy and well complemented the tartar. -> The beetroot cured with lime creme fraiche (third front) – This was my favorite among all the parts in the platter. I never know beetroot can cure salmon to this level. The texture of salmon was now like kingfish or snapper while the taste was extraordinary with a hint of beetroot flavour. Recommended! This was Tina’s favorite entree for the night. The scallop was pan seared to perfection with the center still soft and the whole body was tender. It was sweet in the flesh and the puree has made the scallop to an extra good level. The beautiful flavour of scallop was a good indication of its freshness. Recommended! After serving the entree platter, all bloggers were treated with a trio of Italian dishes. The dish was complemented with harissa paste, Kalamata olives as well as rocket and Parmesan salad with balsamic vinegar. The sides probably can give you an idea how this dish taste. It was a bit sour while the kalamata oilve contributed some saltiness to balance the taste. The gnocchi was soft and chewy (in a good way) and was pretty clean on the palate with small amount of creaminess experienced. Well done! The huge ravioli was just as great as you could imagine. It was filled with tantalising goat cheese with strong lime acidity. I normally can’t tolerate the game taste of most of the goat cheese, even some top ones in the world but the acidic lime flavour actually brought the game taste down almost to zero leaving a creamy, enjoyable and strong flavour on palate. I also like the addition of the toasted pine nuts which in turn promoted the flavour of the ravioli well and added extra complexity for diners to experience. Recommended! I enjoy most of the squid ink dishes as they never disappointed me in the past, so does this one. The risotto was cooked to the correct level of softness on the rice and the black squid ink flavour just dominated the whole dish. The marinated calamari showed exactly what this dish was about. 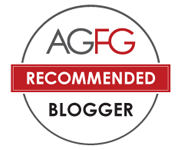 Well done and recommended! The food was very good and I basically expected for my main now. Following the pastas, the mains flied to us. As indicated previously, the main menu was made up with seafood and meat. Some of these dishes were Asian inspired and some of them were from the grill. For my main, I chose the restaurant’s signature dish. I had really good experience with Angus Pure before and enjoyed some of their cuts since then. This dish has taken my tastebuds to a different level. The meat was cooked medium rare as recommended by the chef. It was super flavoursome and made my mouth watering before even having my first bite. I guess that’s a typical action of all foodies :P. The addition of the smoked quail eggs helped the meaty flavour to last longer on my palate while the truffle jus introduced extremely fragrant aroma onto the plate and the palate. Well done! This dish was so delicious! The soup on its own can make me happy for a day. Tina ordered this dish but because she was almost full, I got a chance to finish it up. The seafood broth exhibited strong fresh seafood flavour and a hint of some beautiful fermentation flavours, which may come from the cooking of the seafood. There were two pieces of fish, both of which were perfected cooked with semi soft and semi crispy skins, while the flesh was very soft, easy to break and flushed down with a good drop of sav. blanc. from Petaluma. 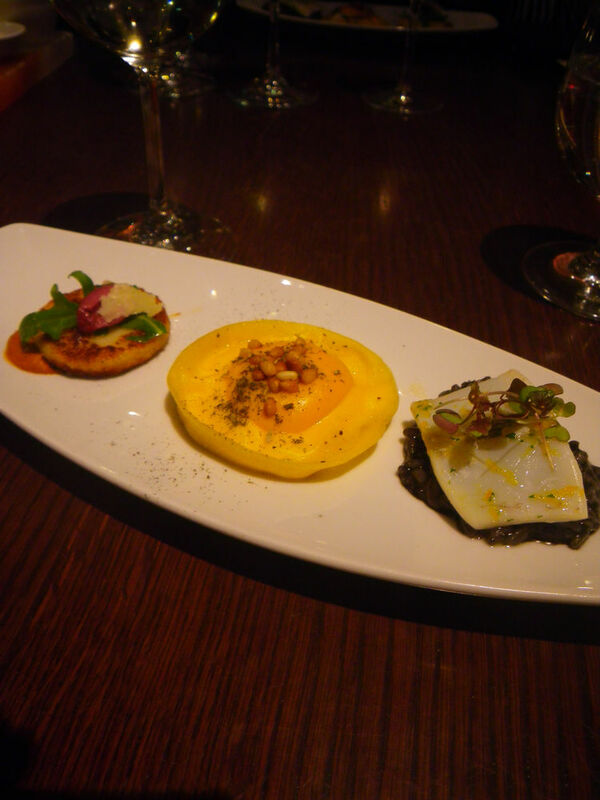 The scallop again showed sweet flavour and every component in the dish was just perfectly matched with each other. Highly recommended! If you still have room for desserts, the following dish will be fantastic to finish the night off with. 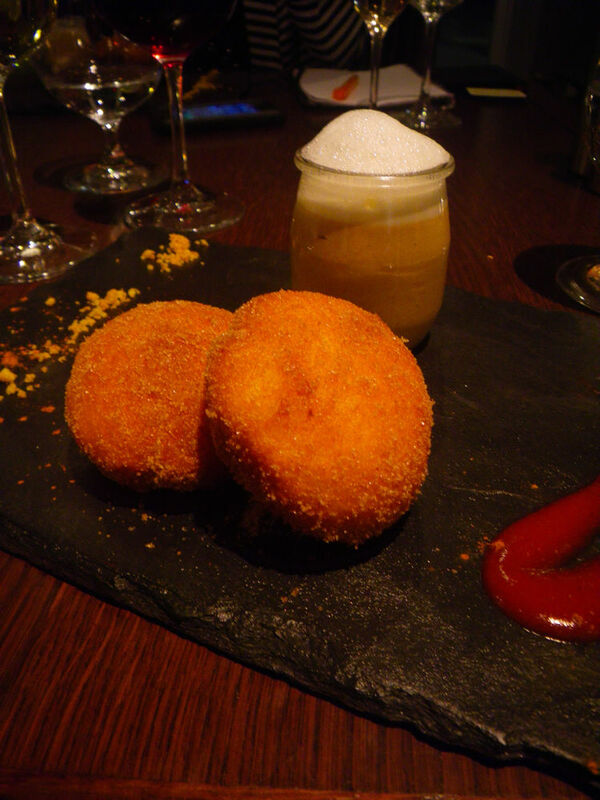 This is one of the dishes that the redsalt has been praised for on social media. The coffee semifreddo with the frangelico was a delish creation. It provided good levels of sweetness and bitterness, which could be essential to cleanse the palate after a long dinner. The doughnuts were fried to perfection and were sweet too. Recommended if you have sweet teeth! 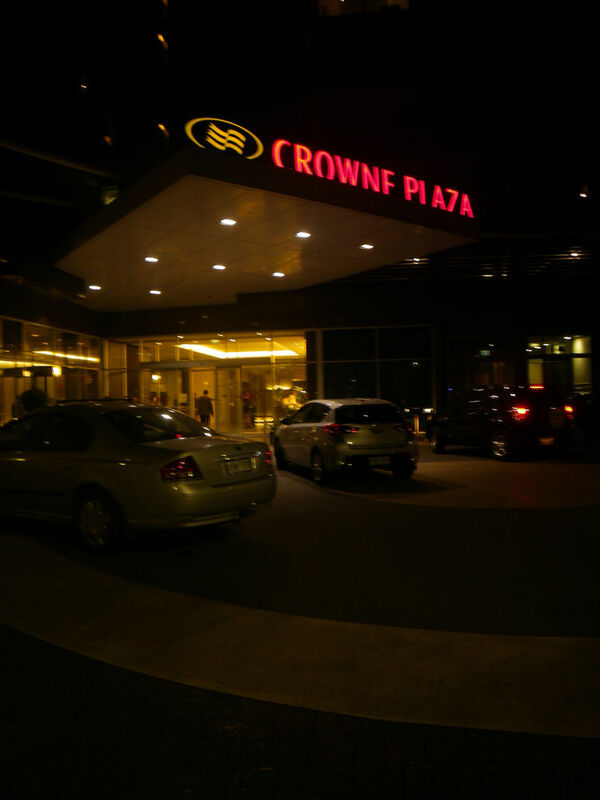 The whole experience were very pleasant and everyone at the dinner has enjoyed the night. 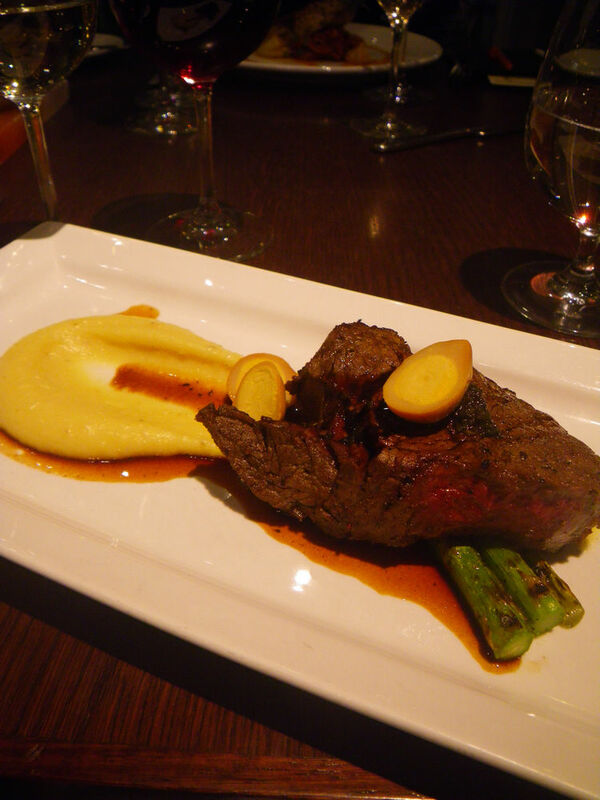 The restaurant has an extensive wine list and some of them matched the flavours of the dishes well. If you like wine and food pairing, then definitely try some of the best South Australian wines out here at the restaurant. [Disclaimer] We are guests of the hotel and the food was provided but all opinions are our own. What a yummy dinner you have had! We used to go there often several years ago. Glad to see many lovely dishes. Maybe you could go back and try them out this season. G’day! Sounds like the food was plentiful and delicious Xin! Glad you and Tina enjoyed! You got some amazing dishes here. Will definitely check this place out in future.